In crime fiction, as in all other genres, the mark of a true classic is a novel’s ability to transcend time and cross geographical boundaries. ‘Vanish in an Instant’ by US author Margaret Millar, first published in 1952, is just such a classic, and a brilliant addition to Pushkin Vertigo’s eclectic collection of international 1950s and 1960s crime fiction. ‘Vanish in an Instant’ is set in a small Michigan town, Arbana, but the events could be just as easily taking place in suburban England or even in the quieter residential parts of a major European city like Paris. It isn’t a story about headline-grabbing serial crimes, nor does it feature a fearless detective, a powerful police department or master criminals/organised crime. It’s a story about normal people, whose personal triumphs and tragedies Millar subjects to exacting yet compassionate scrutiny, with a literary touch that’s both incredibly sharp and light enough for the occasional twist of wry humour to filter through. On a freezing cold December night, Virginia Barkeley, a respectable young lady and the wife of an Arbana physician, is found wandering the streets, stupendously drunk, her clothes blood-soaked. It doesn’t take long for the County Sheriff and his men to link her to the violent killing of Claude Margolis, a local businessman whose penchant for being a ladies’ man didn’t stop him from having a wife and children, who was found stabbed to death the same night. The blood on Virginia’s clothes is indeed Claude’s, and while Virginia admits to having spent part of the evening with him, allegedly drinking and dancing, she refuses to offer any other explanation, or to say anything else. The Sheriff has no option but to arrest her, and this prompts Mrs Hamilton, Virginia’s mother, to come to her daughter’s rescue all the way from California, where Mrs Hamilton lives as a wealthy, respected widow. A local lawyer, Eric Meecham, a solitary, conscientious yet cynical practitioner in his early thirties, is retained to assist Virginia – but Mrs Hamilton dislikes Meecham on sight, making his job, as a lawyer caught between an extremely unforthcoming murder suspect and her domineering mother, even harder. While Meecham tries to make sense of Virginia’s position, enter Duane Loftus, an awkward young man whom Meecham first sees loitering outside the Barkeley’s house. Meecham challenges Loftus, who asks him to call the police, and wearily proceeds to confess he has murdered Claude Margolis. Loftus’ account is convincing enough, and the Sheriff is once again left with no option but to detain him, and to set Virginia free. This is pretty much all that I can reveal about the plot without spoiling it too much – and Millar spins such a wickedly clever plot that it would be a capital offence to do so. What I can try to do is give a sense of the smart, intriguing fashion in which Millar crafts her characters. Yes, there is a body in the first chapter, there is an investigation and one, in fact two murder suspects pop up in quick succession, as in any self-respecting crime novel. But what propels ‘Vanish in an Instant’ to another level altogether is Millar’s skill in breathing life into her characters: they are ordinary people in an ordinary mid-America town from over 60 years ago, yet they are intensely alive on the page, thanks to Millar’s razor-sharp observations about their lives, and insights about their aspirations. And above all, thanks to Millar’s brilliant ear for dialogue. Though the story is set some time ago, the dialogues are so incisive and ring so true that they transport the reader right at the core of the events, creating characters – people – that are truly intriguing. Virginia isn’t just a pretty face, and there’s a lot going on between her and her mother, who in turn is a more layered character, quite sinisterly so in fact, than the overbearing rich momma we glimpse initially. Meecham cannot be written off as simply the archetypal, cynical small-town lawyer, there’s an integrity and tenaciousness to him that belongs to a man with much broader horizons in life. And Loftus, whom we soon learn is dying of leukaemia, is an extraordinary creation, a luckless, tortured young man with a troubled past. Tragically, he has no future, but his past will hold the key to the extraordinary events taking place in Arbana. There are other key personae in the story, from Mrs Hearst, Loftus’ gritty yet compassionate landlady, to Loftus’ crazy alcoholic mother, to Alice, a young woman who came to Arbana as a helper for Mrs Hamilton, to Virginia Barkeley’s doctor husband. All of them play a role in the events, like tiles in a mosaic which Millar shuffles up and refashions at will, making a new picture emerge with every new tile that slots into place. A picture which constantly changes, as anything we fathom about the plot is liable to vanish in an instant, every time Millar subtly shifts the narrative perspective, opening up unexpected possibilities, and keeping her cards close to her chest to the very end. To her credit, she is always in complete control of the story, and even by contemporary standards the pace rarely flags. 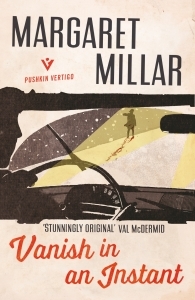 I think ‘Vanish in an Instant’ is a great crime read and a fascinating novel, and I hope Pushkin Vertigo will treat us to more of Millar’s novels soon.